The ride seemed improved in the Rogue as last year’s was a bit choppy, and I had both during cold weather that tends to stiffen suspensions and harden tires. Riding on a 106.5-inch wheelbase the Rogue should behave well on choppy Midwestern roads. While severe bumps and potholes still were felt, overall the ride is much less harsh than before. The Rogue is Nissan's No. 1 seller. Naturally, the safety gadgets are in full array here, especially after the $3,530 Sun & Sound Touring package was added. It includes ProPilot Assist, a semi-autonomous driving system. Think lane departure assist on steroids. It works in conjunction with cruise control and lane departure. 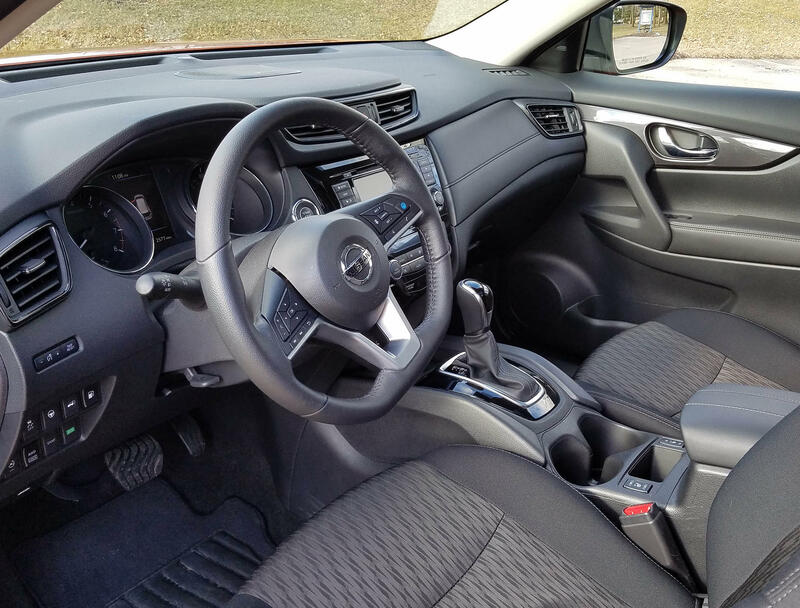 When engaged it makes small corrections to your steering to keep the Rogue centered in its lane. It does the same when rounding curves so long as the system can see both the center and side lane markings. The Rogue is a happy blend of comfort, roominess, decent looks and great value, exactly the reason you see so many on the streets. As I had last test drive, I used this on the highway and it was fine, but you must get used to the wheel twitching a bit in your hands as it corrects your steering. Yet this seemed less twitchy than last time, so a bit of refinement has smoothed it. Note too that you cannot let go of the steering wheel for more than a few seconds or the system senses your inattention and alerts you to take control of the wheel. 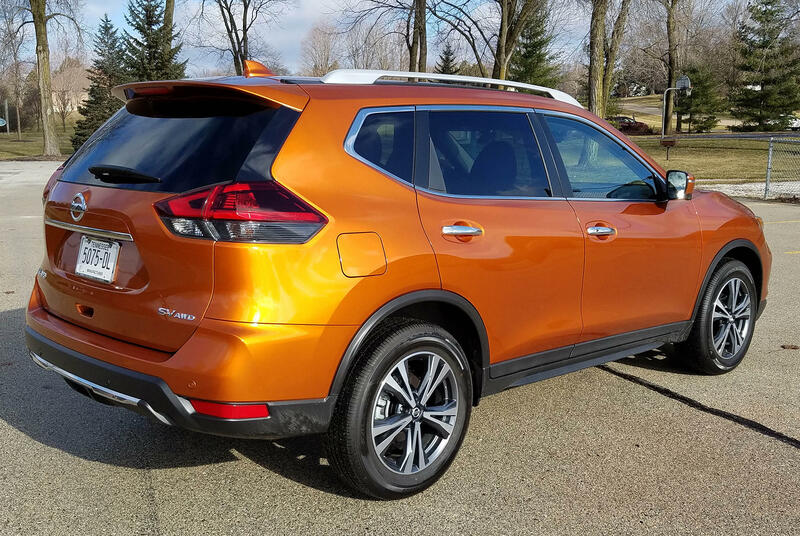 "This is a fine compact crossover for hauling the family, or stuff." 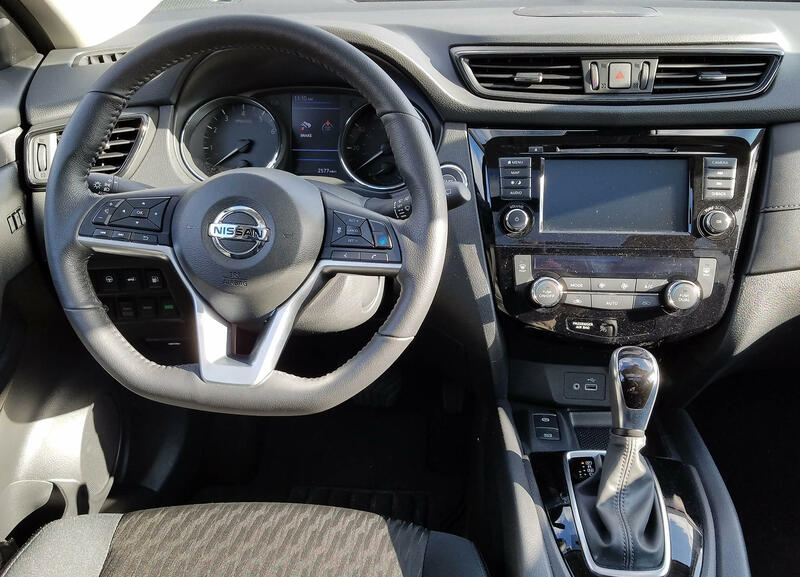 The Nissan Rogue's manual tilt/telescope steering wheel has the usual assortment of radio, cruise and phone buttons. Nissan’s infotainment screen seems small, although it’s 7-inches. I think the size of the numbers and digits on the screen create a perception of smallness. It was harder to read than the screen in last week’s Forester. This one functioned well, including touchscreen buttons you could program favorite channels on. However, the buttons did not respond to a gloved hand, whereas the Forester’s did. Up top is that big sunroof and in back a power hatch with a wiper. Cargo space is generous under the hatch and the rear seats fold down in a 40/20/40 split. Those seats also slide forward or back to increase rear passenger legroom, or boost cargo space, as needed. So this is a fine compact crossover for hauling the family, or stuff. There were a few irritants too, but none major. The heated steering wheel never got really hot and took about 10 minutes to fully warm. I also could find no way to shut off the annoying beep that the lane departure system uses. In city driving these systems can become distracting. I also was disappointed by the Rogue’s gas mileage. The EPA rates the Rogue SV AWD at 22 mpg city and 32 mpg highway. I got 21.5 mpg, including about 30 percent of my time on a highway. While it was cold during the drive it certainly was not unusual for a Wisconsin winter. Last year I’d gotten 26.2 mpg.